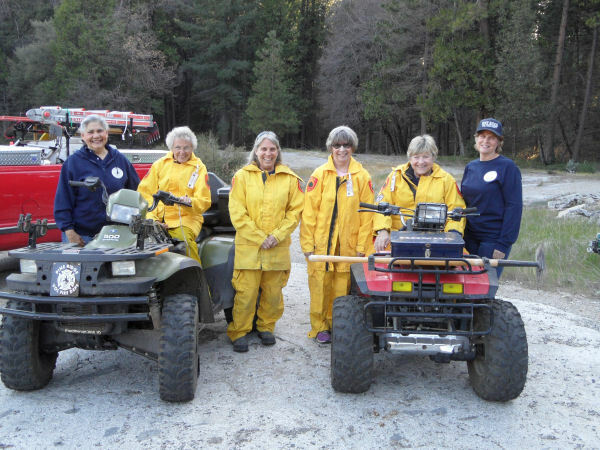 The Road Rangers from left to right, Dory van Loon, Royella Van Dyne, Captain Cindy Holeman, Trudy Colbert, Sue Martin, and Melanie Banton. The Road Rangers are composed of a small group of members, who's primary responsibility is traffic control during an incident. They direct emergency traffic to the incident scene and local traffic away from the area. The Road Ranger's wear day-glo vests and helmets and are equipped with radios, slow/stop signs, flashlights and orange traffic cones. They are a great asset to the fire department and much appreciated by incoming resources.